THE nominees for Melksham News’ Person of the Year 2018 competition have been shortlisted, and now readers are being asked to cast their vote on who they think should be crowned the winner. In our last issue, Melksham News asked readers to nominate their ‘Person of the Year’ – somebody in the town who deserves recognition for their outstanding actions over the past year or who has had the biggest impact on life in the town. Below is the shortlist. 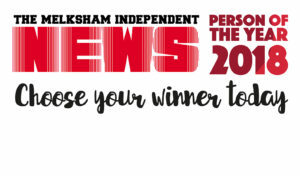 You can vote on our website – www.melkshamnews.com; by emailing your choice to news@melkshamnews.co.uk (please include your own name and address) or by filling out the form on page 5 and returning it to Melksham News, 31 Market Place, Melksham. SN12 6ES The deadline for voting is 3pm on Wednesday 23rd January. In his first year as manager of Melksham Town FC, Kieran saw huge success with the club winning promotion into the Southern League – the highest level of football the club has ever played at. The team also made history by reaching the quarter-finals of the FA Vase – attracting record crowds. At his gym, CrossFit Civitas, in Melksham, Kieran organised a number of fundraisers raising money for charities that support multiple sclerosis, epilepsy, bowel cancer, and Great Ormond Street Hospital. After the premature birth of her granddaughter five years ago, Stevie was inspired to start making layettes – packs consisting of clothing, hats, a nappy, teddy bear and blanket – for newborn babies too small to wear regular clothing. Stevie donates her work to hospitals and charities across the country and is kept so busy she has created her own ‘craft room’ at her home in Berryfield. She has also expanded her work to create twiddlemuffs for dementia patients – a knitted muff with items attached that patients can play with to keep themselves occupied. Owners of the White Hart in Atworth, Nathan and Kirsty are celebrating 10 years behind the bar this month. Since taking over, the pub has become a community hub for the village, and the couple have hosted a whole host of charity events, raising nearly £42,000 for local organisations, groups and charities. Events included an annual music festival and the monthly village get-togethers – an opportunity for the community of Atworth to come together and socialise. In 2014, Luke was involved in a head-on collision with a truck, sustaining a traumatic brain injury, leaving him in a coma for six months. Four years later, in August last year, Luke defied the doctors who told him that he may never walk again and took part in Melksham’s 5km parkrun, raising over £1,300 for the Air Ambulance who he credits with saving his life. This year Darren will be celebrating 35 years with the 2385 (Melksham) Squadron Air Training Corps. He first joined the squadron as a cadet, before rising through the ranks to join the staff as officer commanding of the Melksham squadron and then becoming a squadron leader. He retired from his squadron leader role in 2013, but continued as a civilian instructor, helping to train Melksham’s new young cadets. His nomination said, “Darren probably spends more time with his cadets than he does at home! He is there every Wednesday and Friday evening and is always taking them out in his free time for exercises and orienteering trips. He never stops giving! In 2018, 12-year old Ciaran continued with his efforts raising money for charity, raising over £1,000 for the Teenage Cancer Trust by shaving his head, alongside his father Jason. In three years, Ciaran has raised over £2,200 for various charities. He was also named ‘Young Fund-raiser of the Year’ by the MS Society for his swimming challenge in 2017 and received an award at the Melksham Young People Awards. Kathy is well known in the town for her work with a number of volunteer groups and for her role as a Melksham town councillor. As chair of the South West in Bloom Melksham team, Kathy has led the group to victory, winning Gold for two years in a row (2017 & 2018) at the South West in Bloom awards. Luke opened Whitley’s village shop and post office, The Toast Office, in September 2017, realising his vision for a community hub for the village. Since opening, Luke’s store has become a popular place for the community and local groups to meet. Last year, Luke organised a Christmas lights switch-on for the village, which attracted over 200 visitors. Sue hit the headlines late last year when she launched a campaign to save the Melksham Lunch Club after it was closed down by Wiltshire Council. She is also well known in the town for a whole host of other projects including her role with the local walking netball team, the PSG choir, her fundraising events for individuals and groups, her role as a respite carer for foster children, helping children at the library in the summer with reading, and her annual participation in the Melksham Carnival. Teresa has been nominated for her involvement in a number of volunteer groups in the town, as well as the support she offers to groups to help generate funds or raise their profile. She volunteers for the Melksham Brownies and Guides, is a trustee for local charity Young Melksham, and previously ran a school gardening club at Aloeric School. She is also clerk for Melksham Without Parish Council. Retired teacher Adrienne is the current mayor of Melksham. She volunteers as the chair of Melksham’s River and Food Festival, which last year attracted thousands of visitors to the town. She also volunteers for Melksham in Bloom and town tidy days. Luke Johnson -best local place to go at whatever time of the day you fancy. Luke Johnson, he deserves recognition for the wonderful hub he has created for the residents of Whitley, a fabulous place to eat, or just go for a coffee!! Luke Johnson! He has worked very hard to create a community feel. Also Kirsty and Nathan for their fantastic charitable work! Kathy Iles. She works tirelessly to make Melksham a bright, colourful place in the summer months with beautiful flowers. Luke Johnson! Such a lovely guy, who has created an amazing hub for all of the village and surrounding areas. Even offering to deliver food to people during the heavy snow last year!!! Deserves to win. Luke Johnson. The Toast Office is a really lovely place to go, so friendly and welcoming whether on your own or meeting friends. Staff are all so helpful and it has become the heart of the local community pulling everyone together..
Luke Johnson! Such a pretty coffee shop, a really hard worker, a well deserved award! Luke Johnson, we live in The Netherlands but have family who live locally to the toast office. Whenever we visit we make a point of going to the toast office, such a wonderful place to eat , have a coffee or even a glass of wine at the evening opening. We love this place and Luke is always a joy to chat with. Nathan and Kirsty get my vote, its so hard to not only maintain a pub but even harder to make it a hub of the village and raise a substantial amount of money for various charities in so many different ways, They are always struving to think of new ideas…..all of this achieved with a young family to look after, hats off to them they deserve this reward. Luke Johnson is an amazingly hard working young man who has created a wonderful environment for all of Whitley and the local area. A fab place with great cake! Luke Johnson – such an incredible hub for our village. A young entrepreneur with such a big heart. Luke Johnson has made Whitley a community again. Luke Johnson – poured his heart and soul into creating such a wonderful place for the community! Luke Johnson – I may be biased but I know first hand just how hard he has worked day and night to achieve the community hub that Whitley had been missing for so long. Let’s give him the recognition that he deserves! provides huge amounts of support and advice to community groups (including CAWS) in the Melksham area and always with a smile! Teresa Strange. She is very involved in the community and really cares for everything in it. Kirsty and Nathan Cortilla. They are amazing landlords and what they have done for the village and local charities is absolutely fantastic. Kathy Isles. Kathy works tirelessly to help make Melksham the great town it is today and expects no praise in return. Thank you Kathy. I vote for Luke Johnson, what an inspirational young person! He truly cares about his local community. Luke Johnson. He is lovely guy who has created a great business. He deserves recognition for all of his hard work! Stevie Cooke. She has dedicated so much time and care into all the things she makes for the tiny little angels who didn’t get to see this beautiful world we live in and the little ones who have needed care in special care baby units. The time and effort she put in to making twiddle mats for people suffering with dementia and delivering them to care homes and hospitals. She is one of the most selfless people I have ever had the pleasure to know and call a friend. She deserves every recognition for all she has done without any thought of thanks for any of it. Luke Johnson has brought the community together since opening the toast office . Luke Johnson from the toast office has brought a village community back together. It’s a wonderful social meeting place for young and old. He has worked so hard listening and learning at what’s best for the village. Luke Johnson at the toast office gets my vote. He has brought the heart of the village back. He is such a cheerful person and has managed to create a wonderfully modern, comfortable and welcoming place. He’s also great with the little ones and always has a smile, so important when you’re dealing with the public! Luke Johnson , what he has achieved with The Toast office in Whitley is incredible. Luke Johnson, for providing Whitley with a much needed social gathering/meeting coffee shop while still providing the post office and village shop services. All the staff are welcoming and cheerful and have time for a chat, taking their lead from Luke. He has given the village a center, used by the locals, walking and cycling groups bringing life into the village. Darren Gerrish. He has given so much of his personal time to tge ATC and its no easy role. Its a great organisation for young people and without people like Darren Melksham would lose yet another opportunity for young people to socialise and develop vital lifelong skills. Theresa strange. For all her continued work in volunteering . Darren Gerrish for his long term dedication and commitment to the Air Cadets and his support and guidance to the many young people of Melksham. Thank you. Great Civilian instructor helps everyone out at the squadron. I would like to vote for Stevie Cooke for the amazing work she does!!!! I vote for Kathy Iles; her work for Melksham in Bloom is fab. Luke Johnson. He has worked so hard to bring a fantastic social and practical hub to the village. Really impressive young man. I vote for Darren Gerrish for all the good work he has done at Melksham ATC over the years. I vote for Stevie Cook for the inspiring way that she continues to make and donate these essential items. I would like to vote for Kathy Iles who works tirelessly to keep Melksham ‘blooming beautifully’. The turn around Luke’s made since his accident is amazing, and has already planned his next fund raiser for air ambulance. Sue Mortimer for working to reinstate the Luncheon Club after it was closed by WCC and for all the other things she instigates for the benefit of lots of the people of Melksham. Theresa, she goes above and beyond her role for Melksham. Always giving out excellent advice and being available all of the time. Luke Johnson. I have family in the area and wasn’t surprised he was nominated. He has worked incredibly hard and shows what can be achieved with a supportive partner and a great team he can trust. Constantly working and thinking of new Toast Office events the only thing this guy lacks is a holiday!